Modo, the car co-op, has added an all electric car to its fleet, and sent me the following press release. As it happens, I am not a member of that co-op, nor have they offered me the chance to drive the car. So I have very little to add to what appears below. Except to say that for people who need to pick up and return a car near City Hall, I would be very interested to learn about their impressions of this car. VANCOUVER, Nov. 1, 2011 /CNW/ – In a region where sustainability is an important measure of livability, Modo The Car Co-op has added its first fully electric vehicle (EV) to its fleet, a first for carsharing in Western Canada. The not-for-profit carsharing organization was eager to offer an EV to its members once it could confirm that a parking spot with charging infrastructure would be available. The City of Vancouver stepped up and offered Modo a spot with EV charging capacity at a City-owned EasyPark parking lot (453 West 10th Ave., north of City Hall) where an EV public charging pilot is currently underway. Carsharing fits into the City’s Greenest City goals: every carsharing vehicle removes between 4 and 30 vehicles from the road, depending on the study. And an electricity-fuelled vehicle shared by many people further reduces the climate impact from driving cars. The EV, a 2012 Nissan LEAF, is now available to be booked by all Modo members. « New federal seats for BC are not nearly enough! That’s great to see more electric vehicles in the Modo car sharing fleet. 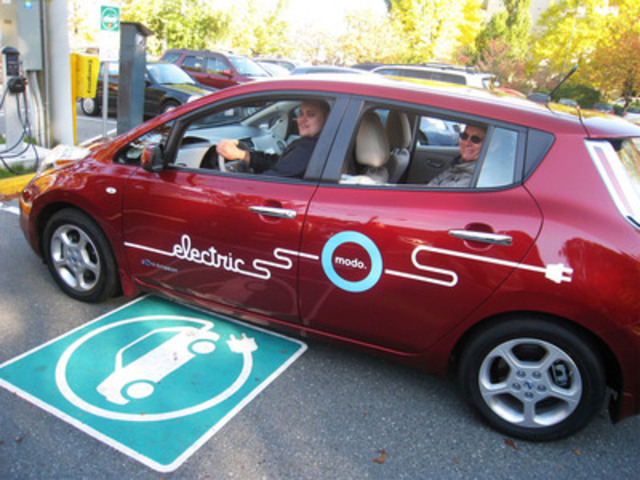 Modo’s first charging station for Plug In Hybrid Vehicle was established earlier this year in partnership with Vancity’s Kitslano Community Branch at Broadway and Waterloo.